The New Mutants #87 is the second most valuable comic from the volume one series. It's ultimately know for having the first full appearance of Cable, but as you can see from the key issue notes, there's a lot more to it than that. Let's start out with the most obvious appearance. 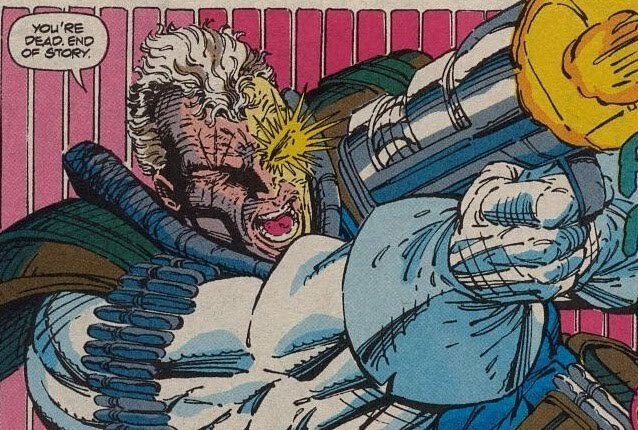 As a lot of people that watched the Deadpool movie know by now, Cable will be making his big screen debut in the upcoming sequel. When said sequel will be released is still unknown at this time, but with San Diego Comic Con right around the corner, I'm sure we'll be hearing some news about it soon. Cable is a time traveling mutant that has telepathy and telekinesis powers. His real name is Nathan Summers. He's the son of Scott Summers and Madelyne Pryor. Scott Summers is better known as Cyclops from the X-Men. At an early age, Nathan was infected with the Techno-Organic Virus, which caused his body to be partially consumed by metal. There was nothing that could be done to save him in the present, so he was sent to the future to be cured. The Mutant Liberation Front is a super mutant group that commits acts of terror in the name of mutant rights. In this issue, the MLF is trying to rescue Skids and Rusty Collins. They were being help captive in a hospital by the government. Skids and Rusty end up leaving the New Mutants and joining the MLF after they are rescued. This comic also has the first full appearance of Stryfe. He is the leader of the MLF. 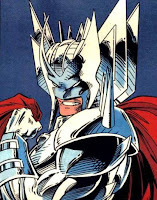 Stryfe is the clone of Nathan Summers. He was created by Mother Askani in case the Techno-Organic Virus completely comsumed Nathan Summers, and he died. 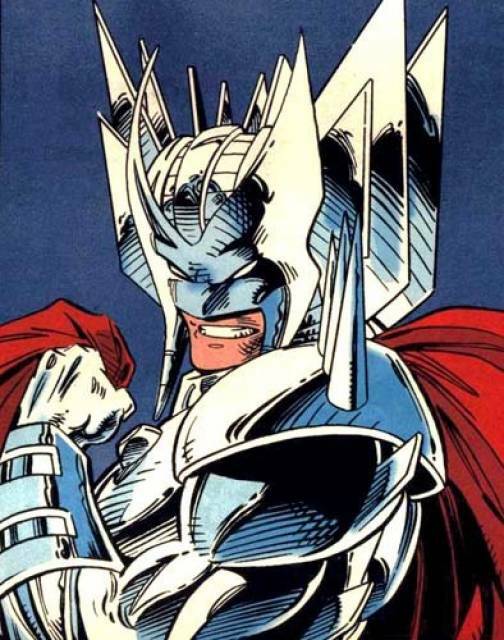 Stryfe was later kidnapped and raised by Apocalypse. Richard Gill, also know as Wildside, is a particularly crazy kind of villain. He has the power to cause hallucination in others, but prefers to scratch, claw, maim and kill using is long sharp nails and teeth. Forearm, aka Michael McCain, is the brute of the MLF. He has an extra set of arms (haha... four arms.... get it?) and has super human strength. Reapers real name is Pantu Hurageb. He is an Mutant Liberation Front member the the power to slow the movements of and paralyze people. Not to be confused with slowing down time. Thumbelina's powers are pretty obvious. She has the ability to shrink down to small sizes, but as she gets smaller, she gets stronger. Her real name is Kristina Anderson. Juliana Worthing is also known as Strobe. Yet another member of the MLF, she has the ability to project blasts of light that can blind and kill her opponents. Here's the MLF member that can slow down or speed up time. Her name is Heather Tucker, or the aptly named Tempo. 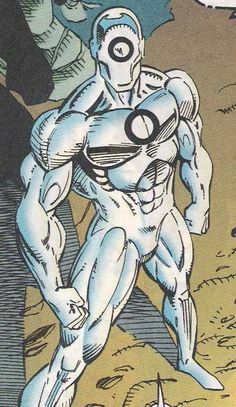 Zero is an android created my the Askani. He has the ability to open a portal for teleportation. However, he can't teleport to a location that he hasn't visited yet. Whew, that was quite the list of characters. All of the characters listed, with the exception of Skids and Rusty Collins, make their first full appearance in the pages of this comic. They all make a cameo appearance in The New Mutants #86. On a side note, all of the characters and the Mutant Liberation Front were created by Rob Liefeld and Louise Simonson. I know what you're going to ask next, are there a lot of graded copies of The New Mutants #87 out there, and the answer is, you betcha, For some reason the CGC website is down right now, but fortunately there are other place on the WWW that have that information. GoCollect has the CGC census listings on their website. I have no idea how up to date it is, as it says that that part of their site is "currently under construction", so who knows. 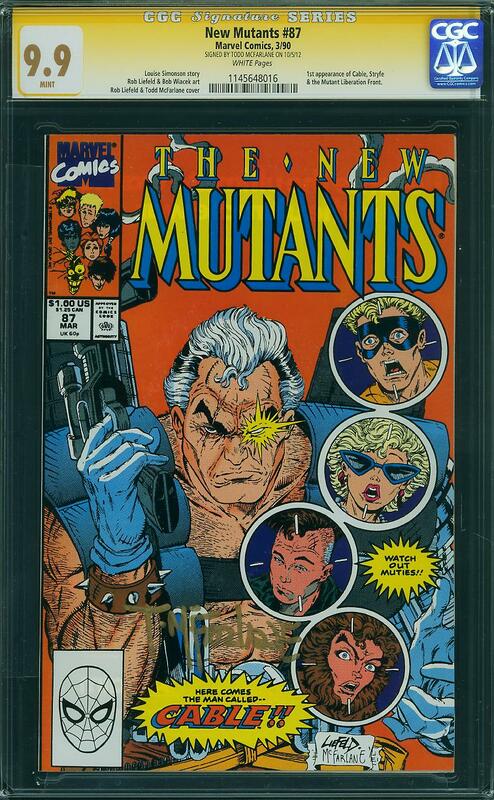 So according to GoCollect, CGC has 4,198 total copies of New Mutants #87 listed in their census. More than half of them are graded an very respectable 9.6 NM+ or higher. There are 5 copies graded at an ultra high 9.9 M, with two of those being Signature Series. Very few of them are graded a 7.5 or lower. That only means that there are a lot of high grade copies for you to snag. There isn't a lot of sales data for 9.9 Mint copy sales, which isn't surprising since there are so few graded, but it looks like a copy sold in 2010 for $2,900. There is a 9.9 Mint Signature series copy at Comic Link right now with an asking price of $15,000, but other than that, I don't know how copies at that grade have sold. However, sales for most other grades have started to see a nice rise in value recently. 9.8 NM/M copies have started creeping toward the $600 mark, and 9.6 NM+ copies have started to go above $250. The confirmation that Cable will be on the big screen is definitely the culprit behind these increases in value. There should be another boost once an actor selected to play the character. There should also be another boost as filming starts, and another as the movie is about to be released. Now might be a good time to snag this comic if #1) your looking to flip it and make a little money or #2) you're a fan of the character and would like to grab a copy while it's at the prices that they're currently at, before they possibly get any higher. You might want to be on the lookout for the second printing on New Mutants #87, as that's also seen a little bump in value. I took a chance and bought a copy right when it was confirmed that Cable would be in the Deadpool sequel, and so far, it's paid off for me, but I'm gonna hold on to my copy for just a little bit longer and see what happens.